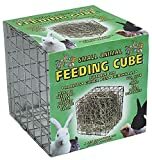 This feeding cube is suitable for all small animals, rabbits, guinea pigs, hamsters, chinchillas, etc. 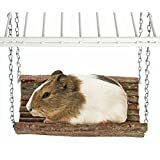 It is suspended by chain & link to keep your pets food off the ground avoiding contamination. This listing is for the large cube measuring 12.5 x 12.5 x 12.5cm. It can be filled with your pets favourites including hay, grass, treats or their main feed. We have a smaller feeding cube available from our other listing.